Answer: So, so close. It’s like if YMF married FMH. Answer: I really hope this was asked, “Guys, are shoulders immodest?” And I hope the answer came across loud and clear: we have sexualized the female body to a ridiculous degree. It’s time for it to stop. Answer: The ones who laugh at this question and the ones who don’t? Answer: No modesty allowed at home? What happened to being righteous at all times and in all things and in all places? Answer: There are some crazy weird fetishes in this world. Answer: They are definitely more subversive than your average knee. Answer: The good people of Moroni, Utah thank you for your interest in their existence. It only happens once in a dispensation. Unrelated- but check this out. 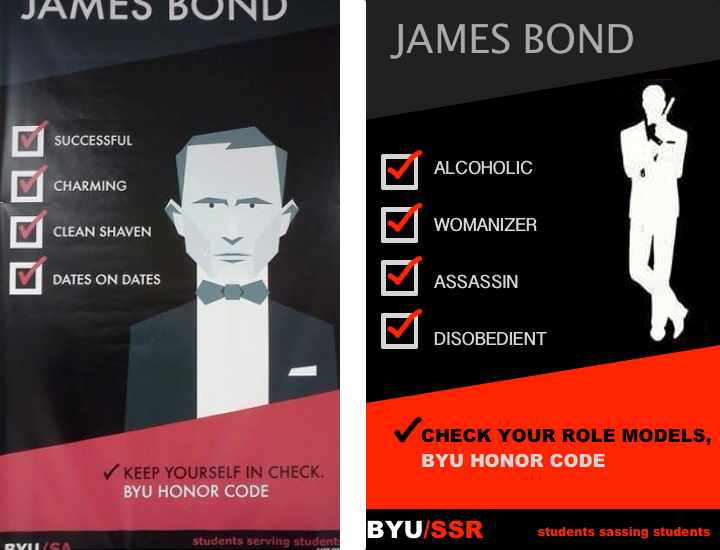 BYUSA thinks that James Bond is a good role model. The Student Review disagrees. Check your role models, BYUSA. This is hilarious. I really, really needed a good laugh right about now. Thank you! IS dead good for healthy???? ?